TREIRB announced the 2,932 TGT PGT Telangana Residential School Teacher posts on treirb.telangana.gov.in. 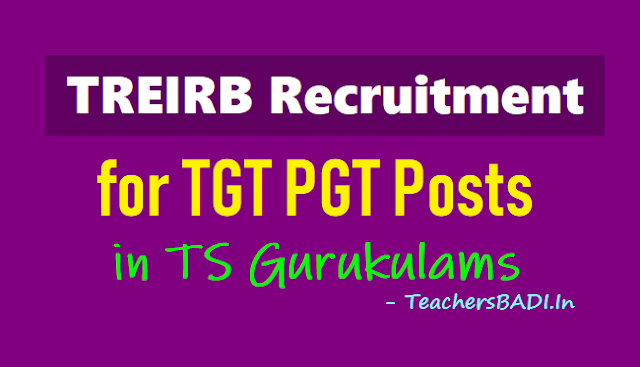 TREIRB Recruitment 2018 for TGT PGT Posts in TS Gurukulams. Apply for 2932 TGT PGT posts in Telangana Residential Schools. Telangana Residential Educational Institutions Recruitment Board, TREIRB has notified and invited online applications for recruitment at 2,932 posts of Trained Graduate Teachers and Post Graduate Teachers in Residential Educational Institutions Societies. Submission of online applications for Telangana Residential Recruitment 2018 at TGT PGT posts begins on July 9, 2018. Last date for submission of online application is August 10, 2018. Examination schedule would be shortly uploaded on the official website of the TREIRB board at treirb.telangana.gov.in. TREIRB Recruitment 2018: Apply to 2,932 TGT, PGT posts by August 8 on treirb.telangana.gov.in: Telangana Residential Educational Institutions Recruitment Board, TREIRB TGT PGT Recruitment 2018 ends on August 8. Apply for TREIRB Recruitment 2018 for 2,932 TGT PGT positions on treirb.telangana.gov.in. Telangana Residential Educational Institutions Recruitment Board, TREIRB Recruitment 2018 for 2,932 Trained Graduate Teachers, TGTs and Postgraduate Teachers, PGTs in Telangana Residential Schools. Last date to apply for TREIRB TGT PGT Recruitment 2018 is August 10, 2018 on the official website, treirb.telangana.gov.in. TREIRB exam dates will be duly notified on treirb.org as well. There are 1972 vacancies for the post of Postgraduate Teacher, PGT as per the recruitment notification. The minimum educational qualification required in order to be eligible for TREIRB PGT Recruitment is TS TET or AP TET or CTET qualification, B.Ed from an NCTE recognised institution and a Masters degree from a college or university recognised by UGC. The payscale bandwidth for PGT posts is Rs 31,460 to Rs 87,130. For the Trained Graduate Teacher, TGT position, there are 960 vacancies in total and the payscale bandwidth is in between Rs 28,940 and Rs 80,930. TREIRB hall tickets are scheduled to be released a week prior to the exam dates, to be notified later on the aforementioned official website. The procedure of selection for PGT and TGT posts consists of a computer-based TRIERB examination which will have 3 papers carrying 100 marks each. Details of Exams to be written by the candidates for each post can be checked here.Direct link to the online application has been given here. Paper 1 with objective-type questions from General Studies, Abilities and Basic English Proficiency, Paper 2 covering the Pedagogy of the concerned subject and Paper 3 which will be testing the knowledge of subject discipline. Kindly note that 20% weightage is to be given to the marks secured in TET exam and 80% to the score obtained in TREIRB written examination. 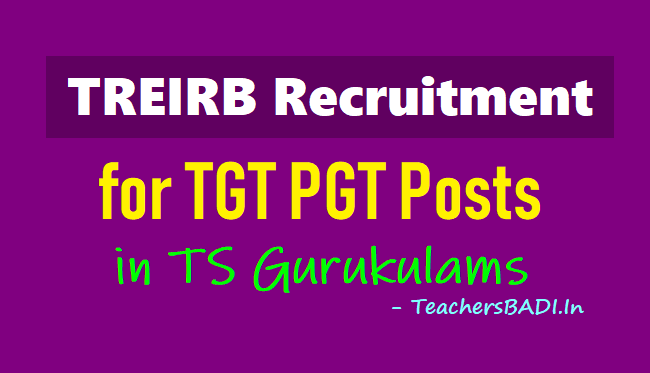 A TS Gurukulams notification has been released by the Telangana Residential Educational Institutions Recruitment Board (TREIRB) for the recruitment of Trained Graduate Teachers (TGT) and Post Graduate Teachers (PGT) in Telangana residential educational institutions societies (TREIS, TSWREIS, TTWREIS, MJP TBCWREIS and TMREIS Residential Instituitions) . A total of 2,932 vacancies are available. 1,972 vacancies are for PGT and 960 are open for TGT. TGT PGT Vacancy details: There are 960 TGT trained graduate teacher vacancies in different societies with the payscale bandwidth of Rs 28,940 to Rs 80,930. There are 1972 vacancies for the PGT Post Graduate teacher vacancies in different societies with the pay scale Rs 31,460 to Rs 87,130.
a. TGT: The selected candidates will get a monthly salary of Rs 28,940 to Rs 80, 930.
b. PGT: The selected candidates will get a monthly salary of Rs 35,120 to Rs 87,130. Eligibility criteria for TGT are such that the candidate should have passed TS TET or APTET or CTET and be a graduate with at least 50% marks from a UGC recognized university and B.Ed from an NCTE recognized the institution. For PGT, it is the same just that the candidate needs to have completed their postgraduation. Graduation with language concerned as one of the optional subjects (or) Bachelor of Oriental Language (or its equivalent) (or) graduation in literature (or) post graduation in language concerned with at least 50 per cent and Language Pandit Training Certificate/B.Ed. with language concerned and should have passed in Paper II of Telangana State Eligibility Test (TSTET)/Andhra Pradesh Teacher Eligibility Test (APTET)/Central Teacher Eligibility Test (CTET). b. PGT: The aspirant should be holding a post graduate degree in the subject concerned (or its equivalent) with at least 50 per cent marks in aggregate from a university recognised by the UGC. He/she should also have pursued Bachelor of Education (B.Ed) or B.A.,B.Ed/B.Sc.,B.Ed from any institution recognised by NCTE with the subject concerned as a methodology subject. ii. Age limit: The age of the aspirants should be maximum 44 years and minimum 18 years. Relaxation in age will be provided as per the norms. The Telangana TREIRB Board is yet to announce a date for the exam. Hall tickets would be made available for download a week prior to the date of examination. TREIRB PGT, TGT Recruitment 2018 - Exam Pattern: All the question papers (Paper-I, II & III) except Languages will be supplied in English version only (Paper-I is common for all subjects). Paper-I, II & III are Objective type. The Board reserves the right to conduct the Examinations in OFFLINE OMR mode. 3. Paper 2 (Pedagogy of concerned subject) and 3 (Subject discipline knowledge). 4. Two(2) hours would be given to complete each paper. 5. Except for the languages paper, the medium of instruction for the examination will be in English only. 6. The examination will have objective-type questions and be conducted in online mode. c. Community/ Caste Certificate obtained from Mee Seva/ E Seva i.e., Enrollment number and date of issue etc. and Other relevant certificates. Eligible and interested aspirants to kindly note that 20% weightage is to be given to the TET examination and 80% weightage is to be given to TREIRB written test. b. Last date for submission of online applications: August 10, 2018.
c. Examination date: schedule would be displayed in the Board Website. d. Hall Tickets: Will be made available to be downloaded seven days before commencement of Examination.